His Eminence the Most Reverend Archbishop Demetrios (Trakatellis) of America is the current primate of the Greek Orthodox Archdiocese of America and Exarch of the Atlantic and Pacific Oceans. He is also the Chairman of the Episcopal Assembly of North and Central America. He is the son of the late Georgia and Christos Trakatellis and was born in Thessaloniki, Greece, on February 1, 1928. Upon graduation from high school in 1946, he pursued continuous research in the field of Biblical Studies, enrolling at the University of Athens School of Theology. In 1950, he graduated from the University of Athens School of Theology with distinction. The Archbishop was ordained a deacon in 1960 and a priest in 1964. Prior to coming to the United States in 1965, Demetrios spent time as a monastic. He was elected titular bishop of Vresthena in 1967, as an auxiliary bishop to the Archbishop of Athens with the primary responsibility for the theological education of the clergy. From 1965 to 1971, on scholarship from Harvard Graduate School of Arts and Sciences, Archbishop Demetrios studied New Testament and Christian Origins and was awarded a Ph.D. "with distinction," in 1972. In 1968, he was elected Metropolitan of Attica and Megaridos, but refused the post for reasons related to the canonical order of the Church and to the political conditions in Greece at that time. Later in 1977, he earned a Th.D. in Theology from the University of Athens. From 1983 to 1993, he served as the Distinguished Professor of Biblical Studies and Christian Origins at Holy Cross Greek Orthodox School of Theology in Brookline, Massachusetts. Serving as a faculty member for more than a decade, Demetrios taught many of America's Orthodox clergy. He also taught at Harvard Divinity School as a Visiting Professor of New Testament during the academic years of 1984-85 and 1988-89. After several years in the United States, he returned to Greece in 1993 to pursue full-time scholarly writing and research. At the same time, he assumed responsibilities at the Archdiocese of Athens. A prolific writer, he is the author of four major books: Authority and Passion (1987); The Transcendent God of Eugnostos (1991); Christ, the Pre-existing God (1992); and The Fathers Interpret (1996). In November of 2002, the Archbishop was unanimously elected by the prestigious Academy of Athens as an abroad-residing member in the Discipline of Theology in the areas of Ethics and Political Sciences. He was officially inducted into the Academy on November 14, 2003. 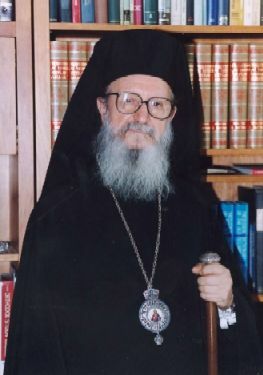 As Archbishop of America and Exarch of the Ecumenical Patriarchate, His Eminence was elected on February 19, 2004, as a member of the Holy Synod of the Ecumenical Patriarchate. This election was part of a modification in the Synod to include six hierarchs from eparchies of the Ecumenical Throne outside of Turkey. The Archbishop attended his first meeting of the Synod which met in Istanbul, Turkey, on March 9-11, 2004. This page was last edited on April 24, 2013, at 22:38. This page has been accessed 27,835 times.